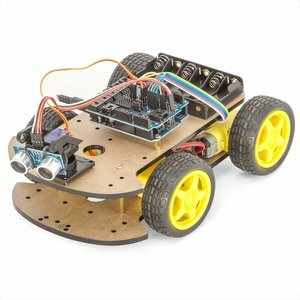 Haitronic 4WD Robot smart car is an electronic construction kit for individual assembly of a smart multi-functional robotic vehicle. It can be constructed and programmed easily with plenty of free codes uploaded from the internet, or made on your own. It is a perfect hands-on way of learning how to use the Arduino platform. It's not only a fun toy, since it can be used to learn the basic principles of working with electronic devices. This construction kit is an analogue of Arduino – an open-source prototyping platform based on easy-to-use hardware and software. Arduino boards are able to read inputs – light on a sensor, a finger on a button, or a message, and turn it into an output – activating a motor, turning on an LED, publishing something online. You can tell your board what to do by sending a set of instructions to the microcontroller. To do so you use the Arduino programming language and the Arduino software, based on processing. Perfect kit to develop creative thinking and get started with electronics. Requires 6 AA size batteries, not included in kit. Battery AA — 6 pcs. + 9V — 1 pc. Robot chassis — 2 pcs. Sensor extension plate V4 — 1 pc. L298N motor driver board — 1 pc. High quality small tire — 4 pcs. Metal gear motor — 4 pcs. 170 point breadboard — 1 pc. TCRT5000 tracing module — 3 pcs. Infrared receiving sensor module — 1 pc. Remote control — 1 pc. SG90 servo — 1 pc. Ultrasonic sensor module — 1 pc. Servo bracket tilt camera platform — 4 pc. Six 5th battery box — 1 pc. 9V battery box — 1 pc. 40 pin dupont line — 1 pc. Set of screws — 1 pc. Battery AA — 6 pcs. Battery 9V — 1 pc.